A trash compactor can reduce the volume of its contents to 0.350 their original value. Neglecting the mass of air expelled, by what factor is the density of the rubbish increased? This is College Physics Answers with Shaun Dychko. We're told that a trash compactor reduces the volume of its contents to 0.35 times the original volume. So the density in the first case before compaction is the mass divided by the initial volume V one. 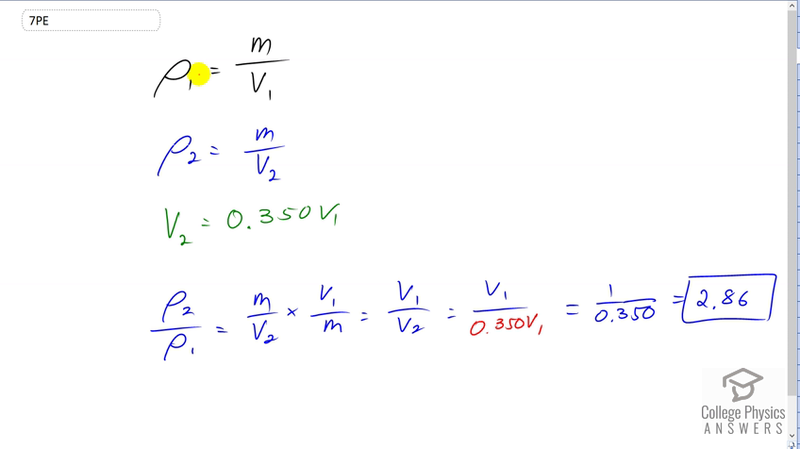 Then after compaction we have density two which equals the same mass divided by a new volume V two. We're told that V two is 0.35 times V one. So we take the ratio of the densities, rho two divided by rho one, that is m over V two which is rho two, divided by m over V one but I didn't write divide by because I don't like dividing a fraction by a fraction. So instead I'm multiplying by the reciprocal of density one, doing that here. So mass over V two times V one over mand that equals V one over V two because the m's cancel. Now V two, we can make a substitution for it here. It is 0.35 times V one and so this ends up being one over 0.35 which is 2.86. So the density in the second case is greater than the density in the first case by a factor of 2.86.